To establish whether clinical-product quality remains constant when making a process change can be a challenging exercise. Limited data availability further complicates the assessment of whether the two populations (pre-change and post-change) are comparable. Historically, comparability is determined using a variety of statistical techniques. These may include, but are not limited to: student’s independent two-sample t-test, statistical equivalency tests, and statistical tolerance intervals. This article addresses the principle behind each approach. Further, we consider a risk-based approach to determine an appropriate strategy for setting comparability criteria, based on probability theory. The appropriation of the student’s t-test for demonstrating comparability involves two distributions that are assumed to be approximately well modeled by normal distributions (note that the procedure may be relatively robust to the assumption of Normality). The null hypothesis for the test assumes equality across the means, with the alternative hypothesis typically assuming unequal means. The p-value calculated from the test statistic is compared with the prescribed significance level (typically 5%). If the p-value exceeds the significance level, comparability is assumed. Importantly, it is recognized that this approach of “proving quality” by failing to reject a null hypothesis is flawed. Under hypothesis testing, the “burden of proof” falls on the null hypothesis. Such tests are only able to reject the null hypothesis. Based on this description, the null hypothesis counter-intuitively sets up the test to reject the comparability the experimenter aims to demonstrate. Most practitioners recognize that when it comes to statistical significance, the absence of evidence to reject the null hypothesis and declare inequality is not evidence of equality. In other words, p-values greater than the prescribed significance level are not demonstrative of comparability. Statistical equivalency tests, e.g., two one-sided t-tests (TOST) are widely accepted as the preferred method for demonstrating comparability. In contrast with the student’s independent two-sample t-test approach, the null and alternative hypotheses are correctly designed to test for equivalency. H01: µ1 – µ2 ≤ θ, and H02: µ1– µ2 ≥ θ where µ1 represents the pre-change mean, and µ2 represents the post-change mean. Statistical equivalency is demonstrated if the two one-sided upper 95% confidence limits for the difference between the two means both fall inside the equivalency region (-θ, θ,). A statistical tolerance interval (TI) may be calculated using the pre-change data to set the comparability criteria. A TI covers a proportion (p) of a distribution, e.g., a normal distribution, for a given confidence level. 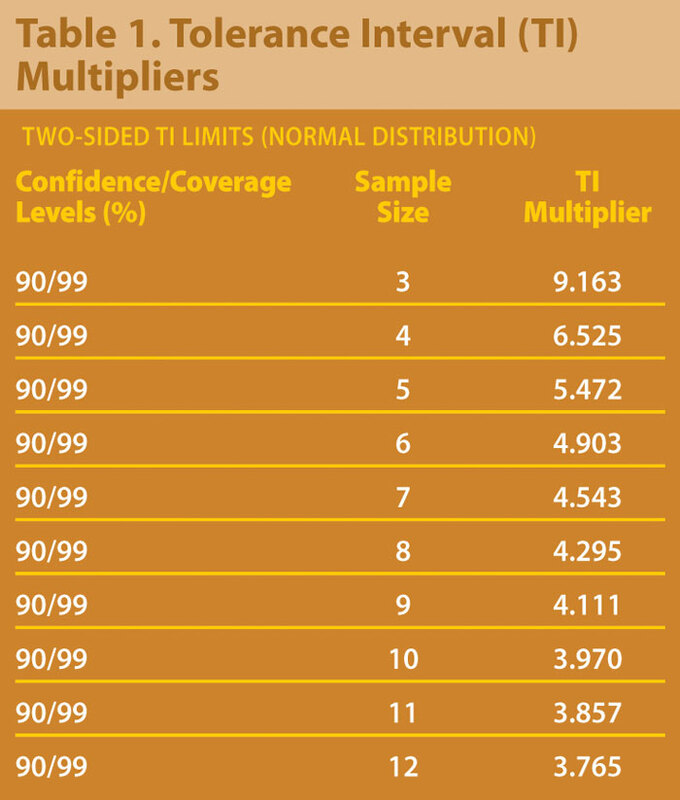 For example, a 95/99% TI covers the middle 99% of a population with 95% confidence. To establish comparability using this approach, data from the post-change process is required to be completely contained inside the TI. TI calculations take a similar form as those for confidence intervals for the mean. The formula may be written x + ks where x represents the sample mean from the pre-change process, s represents the sample standard deviation, and k is the tolerance interval multiplier. Table 1 shows multipliers for 90% confidence for 99% of a normal population calculated using SAS 9.1.3. TI approach is not a mathematically derived hypothesis-based test. No p-value is generated to test hypotheses. Practitioners are “rewarded” when calculating a TI using smaller amounts of data, i.e., the TI multiplier is larger, making it easier to pass comparability. Comparability is more difficult to correctly show with increasing “new process” data (as one or more values could fall outside the interval by chance alone).